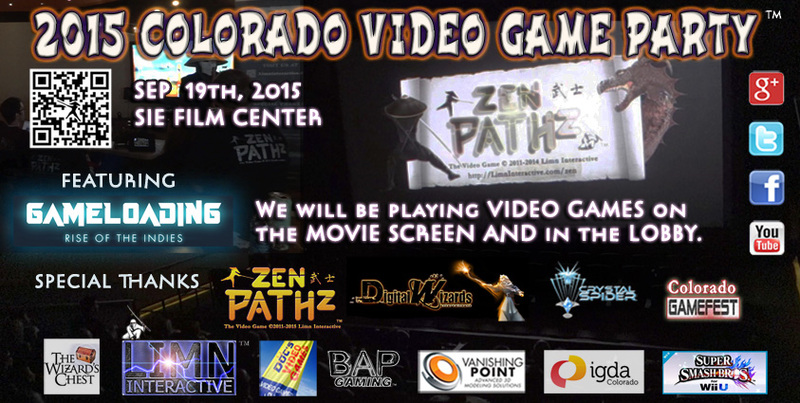 Join us for the fifth annual Colorado Video Game Party September 19th, 2015. Play VIDEO GAMES on the MOVIE SCREEN, in the lobby, and enjoy GameLoading: Rise Of The Indies, a feature length documentary about the exploding subculture of indie game developers around the world. Join the Colorado Video Game community, including the Colorado IGDA Chapter, and more for casual play and Denver esports on the MOVIE SCREEN. They have a full bar inside with local craft beer, popcorn and more. Win prizes. Join us for the raffle. (Entrants must be 18 or over and must be present to win.) Games, attendees, activities, etc subject to change without notice. Our last few events filled to capacity. Make sure you get your tickets HERE before they sell out. Colorado Game Developers, press and partners may also contact us for discount codes. If you are interested in showing a portfolio, games, or anything else you are working on, sponsoring, or getting involved in future events, let us know. We also need help acquiring items for our upcoming events and raffles.